Although I try to keep the availability status of a rabbit up-to-date, I often receive many inquiries about a particular rabbit at once, especially just after it is posted. If you think you might be interested in a rabbit, inquire at once. I work with people in the order that I receive serious inquiry. If you are the first inquirer and I have answered your questions, please let me know whether you are going to buy or pass. If you decide to pass, I will need to let the next inquirer know that they may proceed. I will hold the rabbit for a few days to allow time for your deposit to arrive if you are paying by money order. Or, you may pay instantly electronically. Once we have settled on a price, I can send you the link via email to make credit card, PayPal or echeck payments. Please read my policy on deposits below before paying it. Once your deposit has been received, I will remove the rabbit from the sale listing. Please have cash available for your final payment. You will have the opportunity to check over the rabbit thoroughly before you make your final purchase. If the rabbit is not as advertised or has an unidentified disqualification, I will refund your deposit. If you decide you do not want a rabbit, don’t have room for it, want to purchase rabbits from someone else instead or do not show up to complete the purchase, I will keep your deposit. I will reschedule pick ups within reason. Deposits are required to hold rabbits. A deposit of 50% is required to hold breeding rabbits and show bunnies. Full payment is required to hold a specific pet. No deposit is required on pets if you make an appointment and select from those I have at that time (no one has ever left my barn without a pet bunny they really liked). If you want to get a pet bunny at a show, just email me a few days before the show to make sure that I pack some pets for you too select from. Do not send your deposit until I have answered your questions, we have agreed on the price, and we have established when and where you will get your rabbit. As long as you are dealing in good faith, I will not sell a rabbit to someone else while we are in the middle of settling the details. I will mark a rabbit “on hold” for a reasonable period of time while I am waiting for your deposit to arrive. 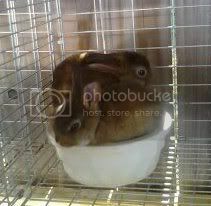 Beyond that period, I will return the rabbit to the “for sale” page. Deposit are non-refundable if you change your mind about wanting the rabbit or if you do not pick up the rabbit as agreed. I will refund your deposit if, when you examine the rabbit in person, it is not as advertised. That is, you discover an undisclosed problem with the rabbit or the strengths and faults are not as described. I will also refund deposits in full if I cancel the sale for any reason. Since we are dealing with live animals, I reserve the right to cancel a sell prior to its completion for any reason. I will reschedule pick-up once within reason. Cage space and the costs of maintaining rabbits is always an issue in a busy barn. You should make every effort to honor our original agreement. But I am aware that illnesses, deaths in the family and the like are beyond anyone’s control. I have pet Holland Lops for sale at all times. I generally have several to choose from. Most of my rabbits are tortoiseshell or broken tortoiseshell, although I do occasionally have other colors. Most pets available from The Nature Trail are males. 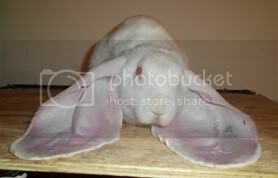 If you want a female rabbit, very seriously consider spaying her for the best results and to extend her life. Male rabbits or spayed female rabbits make the best pet rabbits. Pet rabbits from The Nature Trail are generally between 3 and 6 months old. I do not sell babies who have just been weaned. Part of the reason is that I must grow out my rabbits for awhile to evaluate their show potential. But aside from that, there are many good reasons to wait until a rabbit is older before allowing them to go to their new pet home. First, they are physically more hardy. Rabbits at 8 weeks or younger have just been weaned and are already going through a stressful transition. Often, they cannot handle additional stress and get sick or die. Also, you can better evaluate the adult size of a slightly older rabbit. At 8 weeks, they may appear about the same size. At 4 months, you can better tell which will be the hefty 4 1/2 lb. rabbit and which will be the petite 2 1/2 lb. rabbit. Pet rabbits are $40 each (please check my payment options). Payment in full is required to hold a particular pet rabbit. Generally, it is just best to pick from the ones available. No one yet has failed to find one they just love! I occasionally have rabbits at reduced prices due to some minor imperfection (missing toenail, scar, or bitten ear). I do donate rabbits to charitable organizations. Pet rabbits do not come with pedigrees. However, I have sold several pedigreed rabbits into pet homes. Be sure to check the pedigreed Holland Lops available to see if your new pet rabbit is listed there. I guarantee my pet rabbits for 30 days. I will replace the rabbit or refund your money, at my discretion. If, for any reason, you decide that the rabbit is not for you, please try to find another suitable home for it. If you cannot find another home, please bring it back to me and I will find a home for it. Although I cannot give a refund, I can ensure that the animal is cared for. PLEASE DO NOT RELEASE A HOLLAND LOP INTO THE WILD. IT IS NOT ABLE TO CARE FOR ITSELF. Photos on this page by TC Farms.